This is a review of the Muskie Moose Moose Call. 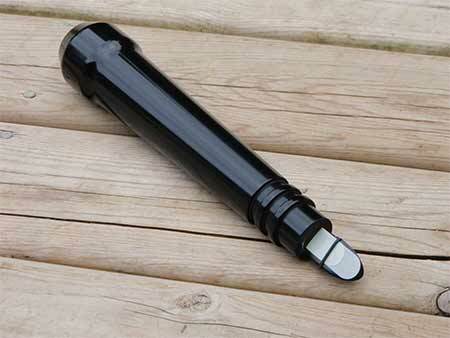 Dave Keslo the owner of Muskie Moose has developed an first-of-its-kind, acrylic moose call. Born from research with live moose, this call was manufactured to sound EXACTLY like the moose do in the wild. Dave has the unique opportunity to study live moose in captivity. The moose he studies live near the wilderness and therefore also get visitors form wild moose. During the breeding season Dave is able to record the sounds of wild moose and his captive moose doing what we want to hear. Making moose sounds. 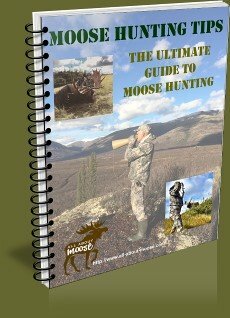 To date I believe Muskie moose has recorded upwards of 30 different moose sounds. Of course these are not all breeding sounds; samplings of his other sounds are: lost calf, cow moose in distress and calf moose in distress. What makes the new Muskie Moose Moose Call unique is the fact that for each call the sounds are "hand-tuned" by Dave to sound exactly like one particular cow moose he has studied. What makes this cow moose so different? This cow would, during her breeding cycle get every bull answering her; including the wild ones. When she called... the boys came looking. 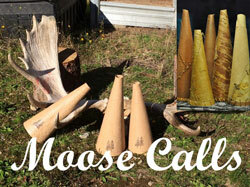 Muskie Moose contacted us earlier in the year and asked us if we were interested in trying out this new moose call? We are always looking to improve the way we hunt moose; especially now that we are also hunting moose with archery equipment. We have to make sure we can coerce theses moose to within easy bow range. We received the Muskie Moose Moose Call in the mail a few weeks ago. 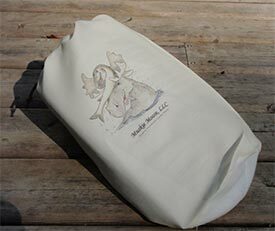 and Horn come in an off white cloth bag emblazoned with the Muskie Moose company logo. 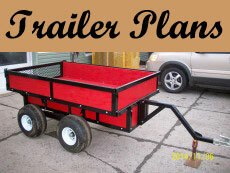 The laminated instruction sheet, detailed instructions that can be taken out-doors without worry. The Horn, Dave tells me, is made from ABS. I found the horn is quite strong and resonates sound very well. Last season I tore a hole in my birch-bark-moose-call while imitating an aggressive moose. This horn should be strong enough that that will not happen. As far as Dave knows is the first acrylic call ever made. The moose call is what really piques my interest. This is a reed style moose call, with the reed exposed so it can never freeze; a good feature for moose hunting, because moose hunters often hunt during cold weather. Unperturbed I tried again... I am sure the Mallards on my pond started to swim in my directions. "I guess I had better read the instructions, huh?" I grabbed a cup of java and sat down and read the instructions. Oh, now I see... blow softly at first, place my lip on the O-ring. Blow... there, that sounded much better. getting it out along with my recorded moose sounds and practicing. I guess it is kind of like a musical instrument... practice makes perfect. Don't be discouraged by my comments. I remember way back when I first called moose using my voice... I don't think I sounded much like a moose then either. The Horn looks good, sounds good too. The large bell offers the moose caller the opportunity to really cover some ground. You can also blow the call into the end of the call to make it sound deeper and to help carry the sounds further. 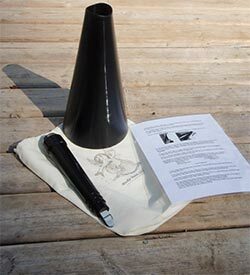 The Muskie Moose Moose Call was designed with the professional hunter or guide in mind. These are well made high end calls. If you like to own the best, you should give these calls a look-see. 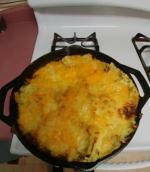 Maybe add one to your moose hunting supplies. If you do... be sure to tell them that All-About-Moose sent you. 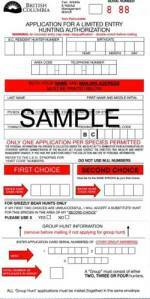 We'll be taking it out moose hunting this fall and put it through its paces. For marketing purposes, it stands to reason that we consumers are attracted to the "bright and shiny" objects. This only thing that is of any concern, that I see so far... is the fact these items are in fact, quite shiny. I don't really like taking shiny objects into the woods when I photograph or hunt moose. Too un-natural! sheen. Or wrap them in camouflage tape as long as that doesn't change the sound too much. It really is a shame to want to sand these items and remove the gloss finish. They look really nice (for consumers). In the moose woods though, you don't want to bring attention to yourself! Update: I have been informed the next generation of these calls will be made from a composite clear acrylic and will be dipped in camouflage. This will certainly eliminate any glare problems. These new and improved calls should be available next year.